We all have a lot of things to do every day, and it can be utterly exhausting. Perhaps that’s the reason that sometimes, laziness simply gets the best of us. 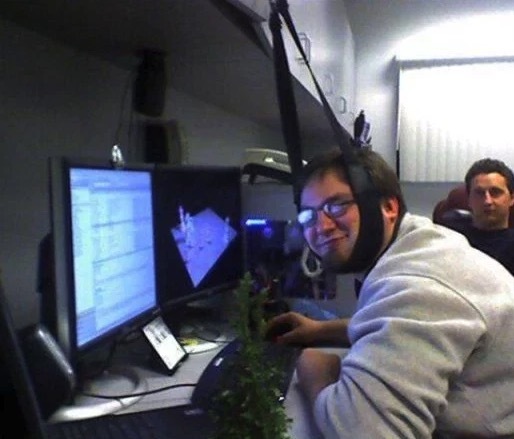 We find ways around doing work every way we possibly can. We’ve all been there, but some people take being lazy to a whole new level. 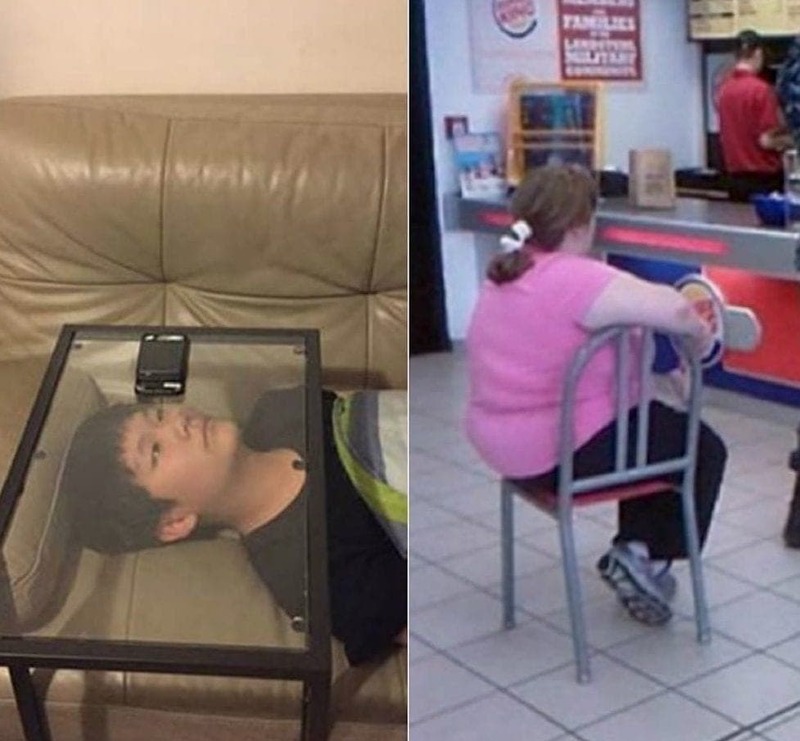 Here are some of the most hilarious examples of extreme laziness out there. How many of these things would you do? Once you come to a conclusion about that, these pictures will make that much more sense to you. There’s just something about popcorn that makes it super fun to eat. When we’re watching a movie, there’s just nothing like it. Usually, however, we eat it out of a big bowl with our hands. That was too much work for this guy, who didn’t want to get his hands all buttery while he was using his computer and keyboard. Instead, he came up with a very clever solution. The best part? He won’t even have any dishes to do after he’s done. If you go to the gym regularly to work out, chances are you’re not such a lazy person. So why would you need to take an escalator to get there? 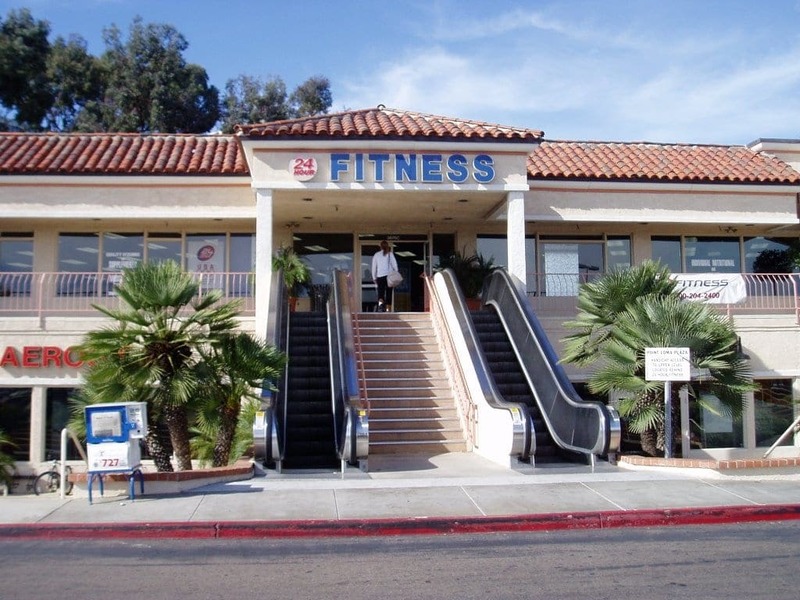 This gym is located in San Diego, and is famous because of the irony of having an escalator at the entrance to a place where people go to get exercize. Perhaps if you work hard enough at the gym, you simply don’t have the energy to take the stairs. 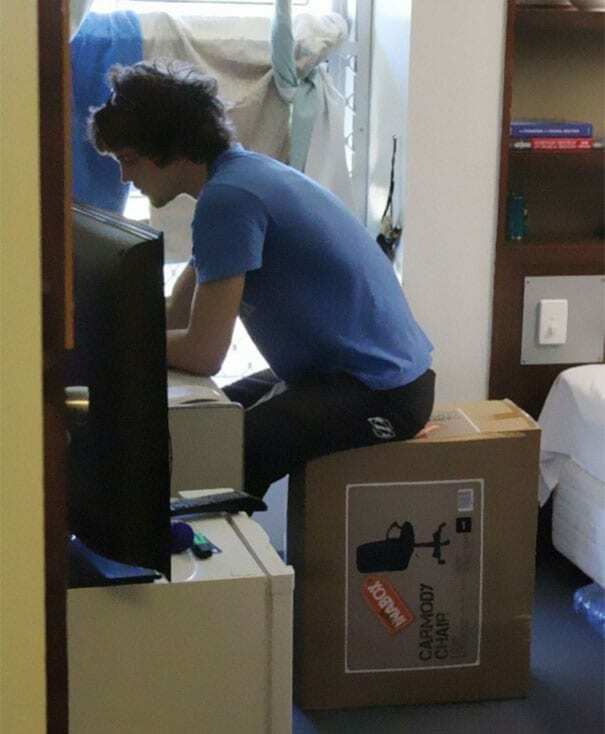 This student went through the trouble of ordering a brand new chair for his room, but then couldn’t be bothered to take it out of the box and put it together. Luckily for him, the chair came in a big, sturdy box, that works nearly as well as the chair inside. So instead of sitting comfortably in his new seat, he decided to use the box instead. Maybe he’ll get around to unpacking it soon… or maybe not. Eating an apple is generally not considered to be a task that requires a whole lot of energy. The person who was snacking on this fruit, however, proved that even that simple activity can be done in a lazy way. 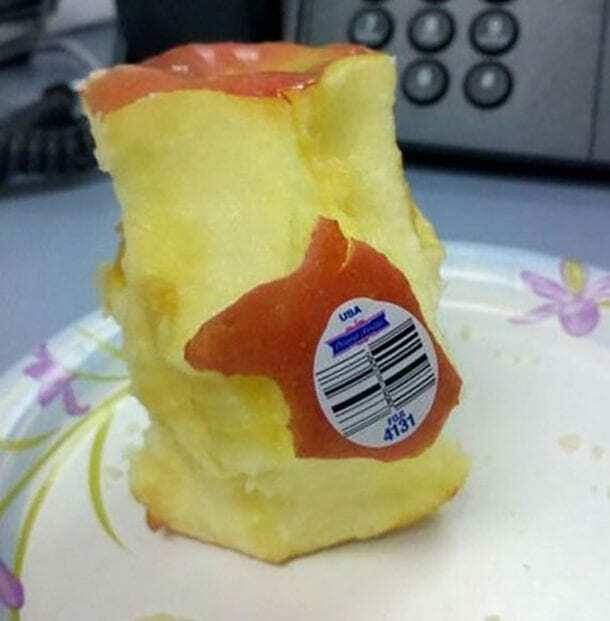 They were too apathetic to even remove the sticker from the apple, instead just munching around it. Honestly, it would probably be easier to take off the sticker than to carefully avoid it every bite you take. This guy is either super lazy, or very much ahead of his time. Nowadays, we have a whole bunch of solutions for those times when you need to make a phone call but can’t use your hands. It’s not hard to find a headset or hands free system to help you make those calls. 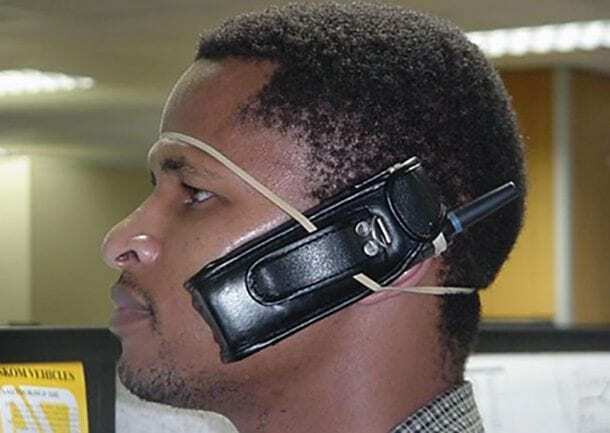 The man in this picture, however, got creative with it, using a rubber band to hold the phone onto his head. It’s actually a pretty practical solution. When you need to get from place to place with a baby, you usually get a stroller so you can easily and comfortably wheel them around while you walk. This mother did just that, but then was too lazy to do the walking part. 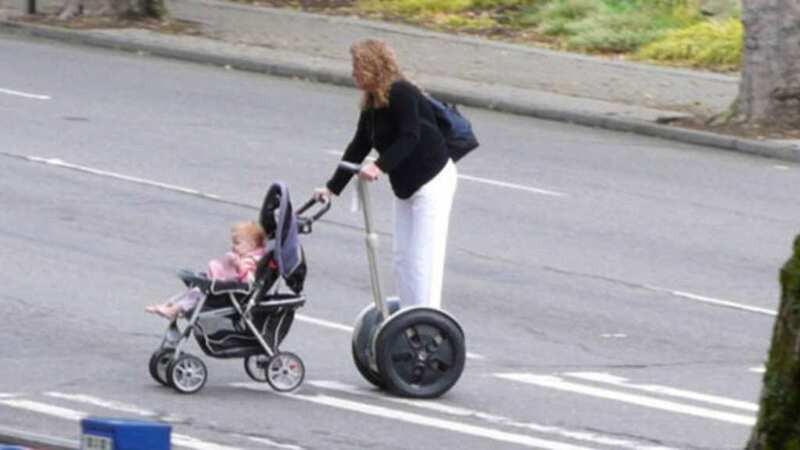 Instead, she got her hands (and feet) on a Segway, and pushed the baby around town without even taking a step. We can’t help thinking that it looks quite a bit more challenging than just walking. Dogs make great pets, as long as you take them outside frequently enough to do their business and get their energy out. 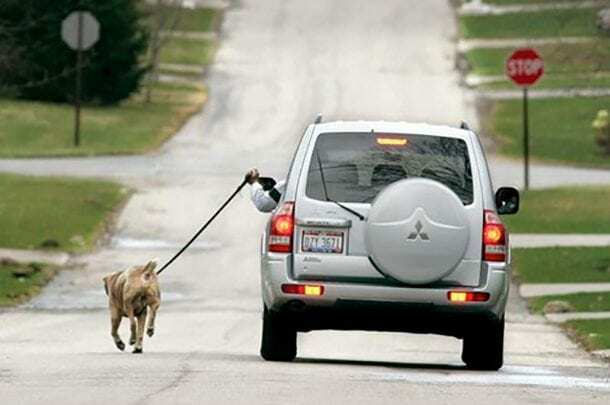 But some people are too lazy to take a walk with their dog, as this picture shows. Instead, this person decided to take their dog on a drive. They let their pup trot alongside the car as they drove down the road. It doesn’t look too safe, but at least it’s a quiet neighborhood, and they look like they’re driving pretty slowly. 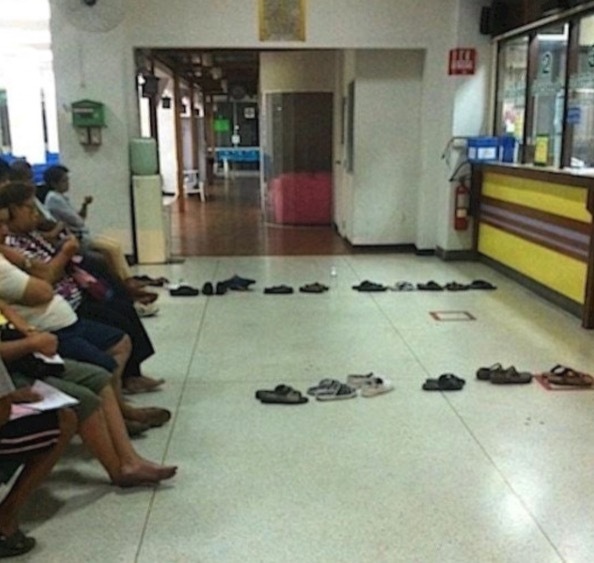 Nobody likes waiting in line, but we all have to do it occasionally. One of the places where you frequently have to wait in line is at a counter service restaurant. 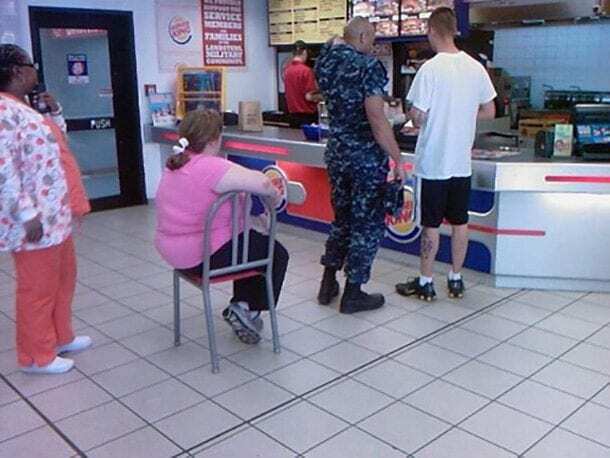 It can be a real bummer when you’re hungry and just want to take a bite out of that Whopper, but most people just stand and wait. We don’t know why this woman brought a chair to the counter, and she might have a pretty good reason. But if not, we would say that it’s a pretty lazy move. Road lines are supposed to be straight. That’s one of the basic ideas behind them – they provide a guide for drivers on the road to follow. The person who was in charge of painting the line on this road, however, just didn’t care. 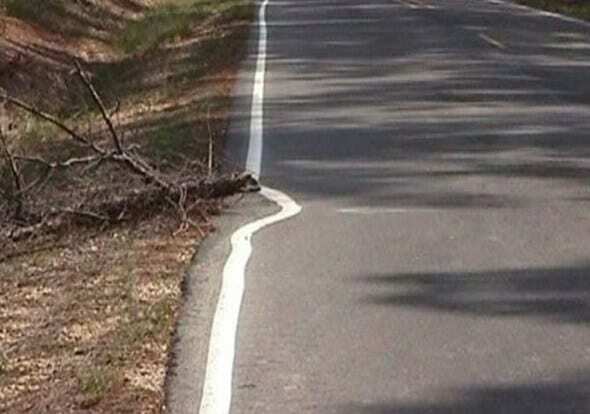 There was a branch in the way, and instead of doing the professional thing and moving the branch so the line would be painted properly, they just painted around the branch. This is the result, and it’s pretty hilarious. One of the most important functions of security guards outside of buildings is to discourage people who don’t belong there from entering. In order to do that properly, however, the guard has to be awake and aware, otherwise potentially dangerous people can just wander in. This security guard knew that, but also really wanted to take a nap. 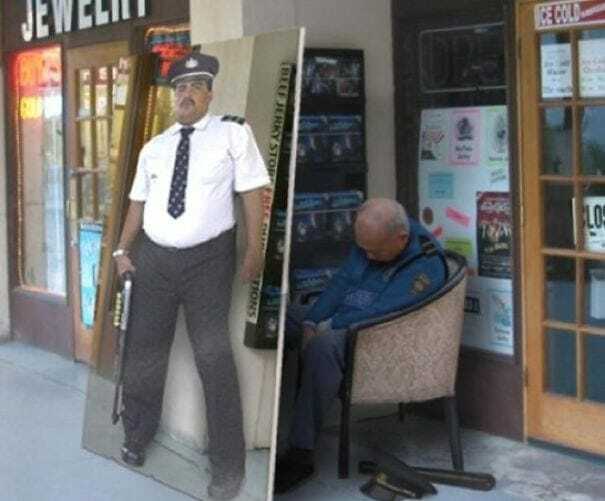 So he came up with a lazy solution: put a life size picture of a guard in front of him while he sleeps. He’s not doing much protecting, that’s for sure. If you have a small lawn with a flagpole in the middle and you want to mow it without any manual labor, this idea is for you. Whoever lives in this house came up with a way to get their lawn mowed by simply tying the lawn mower to a rope that is connected to the flagpole. 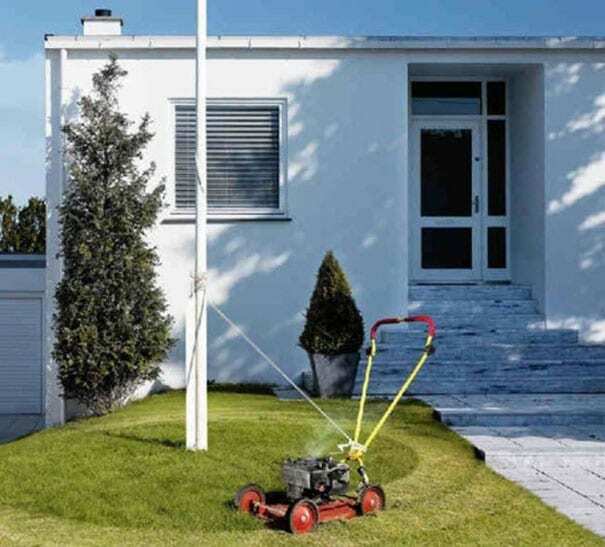 The rope pulls the lawnmower in a circle, and as it does so, the rope wraps itself around the flagpole getting shorter and shorter, so the lawnmower eventually mows the whole lawn. We all know those people who prefer to tell you to look something up rather than give you an answer. 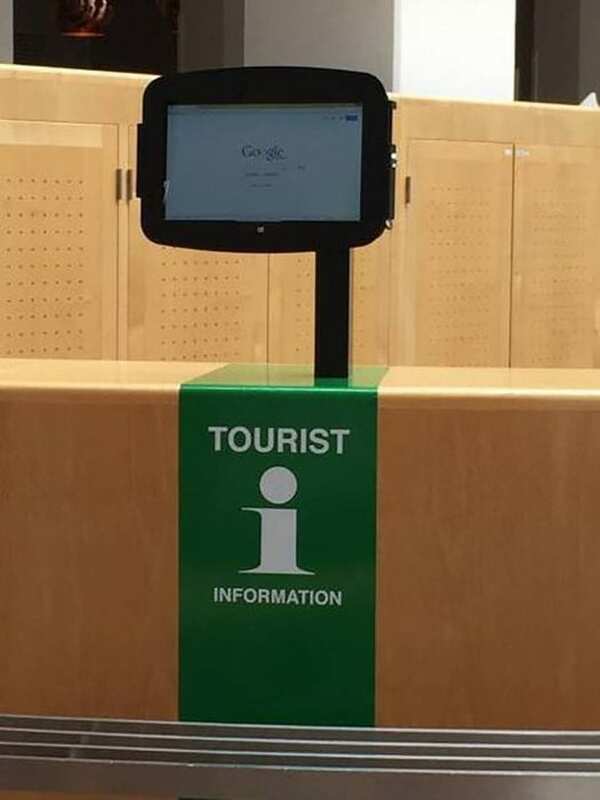 That seems to be what’s going on with this tourist information stand. Sure, you could probably get the information you need from the internet, but sometimes it’s truly easier to speak with someone so you can get the answers that you want. Unfortunately, these folks were all too lazy to stand and take questions, so they left a screen open for you to look it up for yourself. Having a dog can be very rewarding, but it also requires some work. One of the daily tasks that comes with having a dog is taking it out for a walk a few times a day. For some people, this can be a good opportunity to get some much needed exercise. For others, however, it’s just no fun. 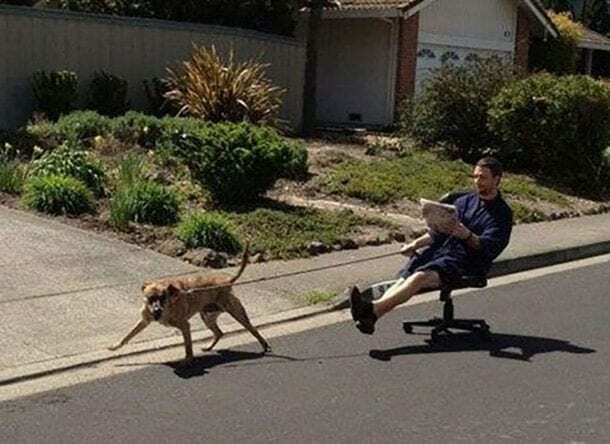 This man came up with a way to avoid the walking part – he let his dog pull him through the neighborhood on a rolling chair. If you live somewhere with cold winters, you know how bothersome snow can be. On those cold snowy mornings, you have to clean off your car before you can go anywhere, and that not only takes up valuable time, it is also an exhausting process. This driver decided against it. 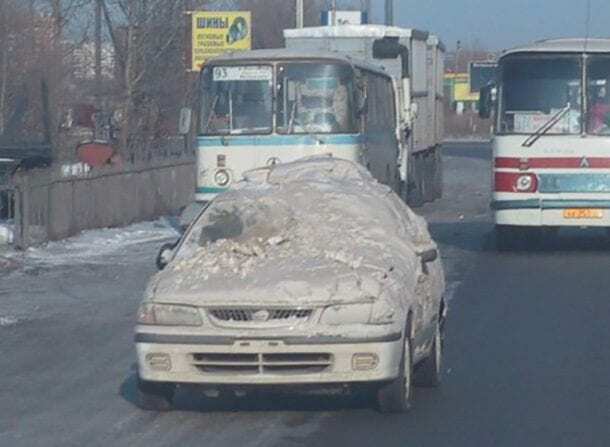 They chose to clear off just enough space to see through the windshield, and then head straight out on the road. Hopefully the rest of the snow will just melt off the car. When we get dressed up to go to fancy events, there is a lot of effort involved. We have to take care of everything from our hair to our makeup to our clothing, and of course, if we are wearing open toed shoes, our toenails. 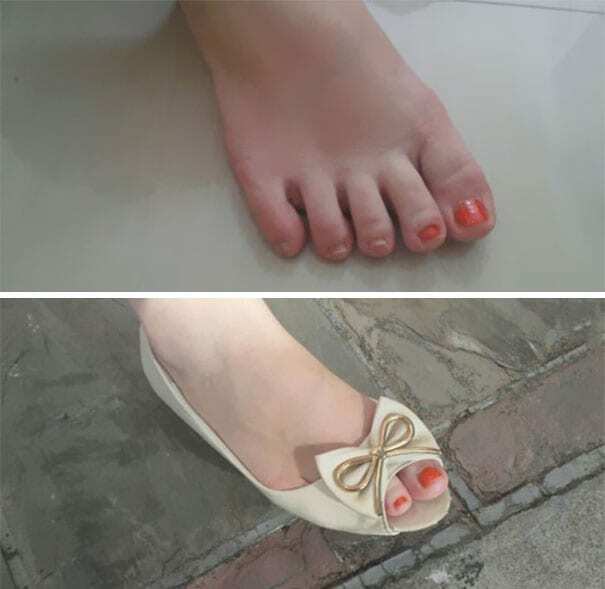 This woman, however, noticed that only two of her toes would be showing, so she decided to cut corners to make things a little bit easier for herself. She just put nail polish on the toes that would be seen. It can be pretty uncomfortable to watch a TV show or movie on your phone. You have to hold it at just the right angle the whole time and it can get irritating pretty quickly. 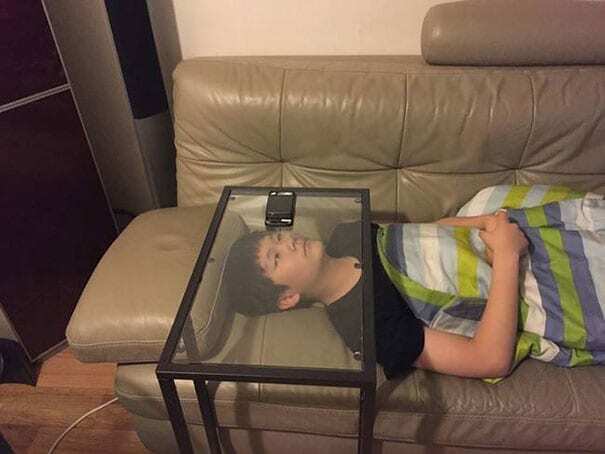 This boy came up with a genius solution. He put his phone on a glass table and then lay down with his head under the table. Now he can enjoy whatever it is that he’s watching without any effort. He just has to remember not to sit up too quickly. Have you ever wanted to enjoy your drink without ever having to lift it up off of the table? 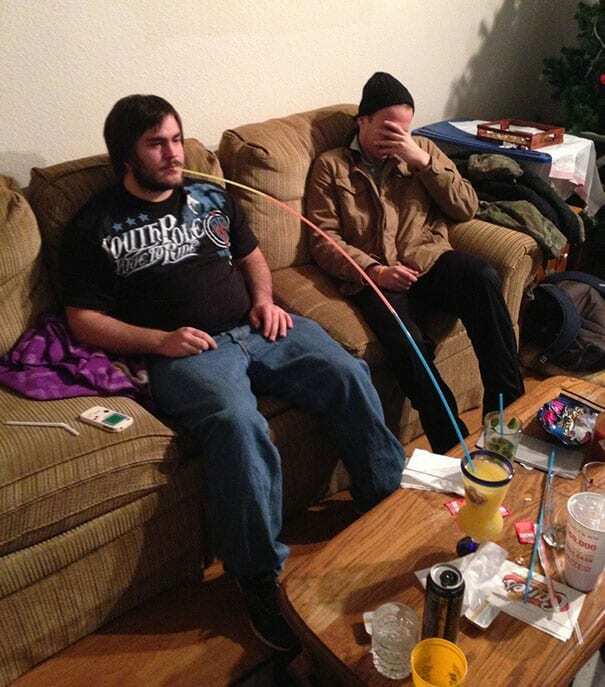 Well, that’s what straws are for. But if for some reason your drink is resting on a table that is located a bit further from your body, you could do what this guy did. He put several straws together to make an extra long straw that reaches from his mouth to his cup. For some reason, his friend doesn’t look too thrilled about the invention. We really have no explanation for this one. What we have here is a teeny tiny island, with one dock, one house, and one road that connects them. The road is extremely short, and it probably would take about a minute to walk the entire distance. 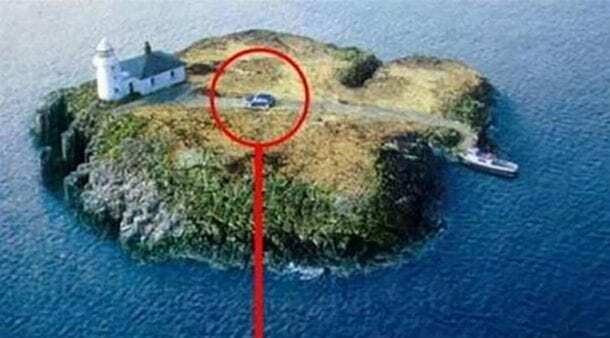 For some unknown reason, however, there is also a car on the island, to drive the short way from the dock to the house and back. This is some serious laziness in action. Escalators are basically stairs for lazy people. Usually, they are built in places with a lot of stairs in order to give people who would rather not climb so far a way up. 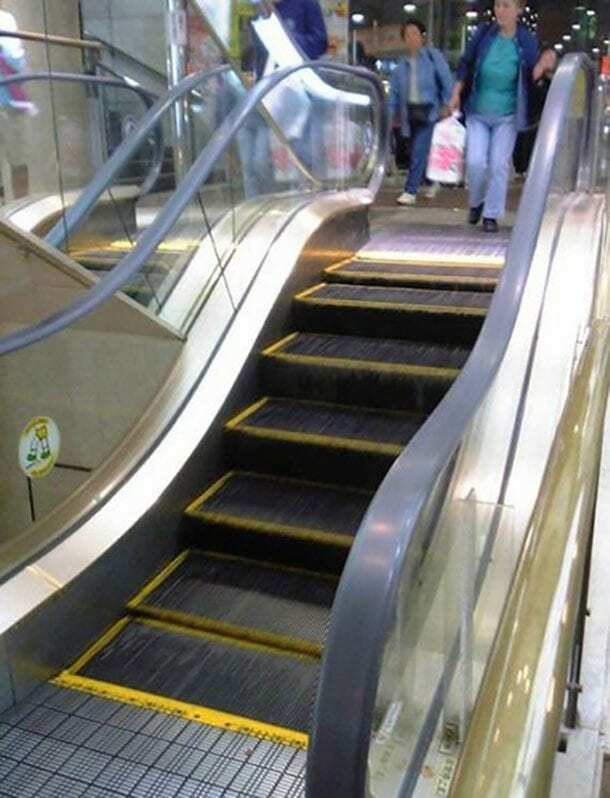 In this case, the escalator is so short that we’re not even sure why it’s necessary. There are really just four steps between the bottom and the top of the escalator. Are people really so lazy that they can’t go up four steps? The answer seems to be yes. This is a level of laziness we have all witnessed. 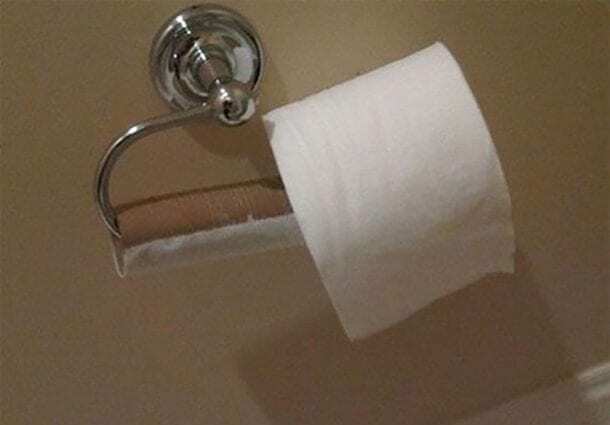 Changing the roll of toilet paper is not a particularly difficult or time consuming task, but so many people are just too lazy to ever do it. The person who used up the old roll of toilet paper in this bathroom just didn’t have it in them to remove the empty roll from the dispenser, and instead stuck the new one on right on top of it. Those extra three seconds would have been too much for this person. When this guy first started gaming while lying down, he realized he had a problem. With his head on the pillow, he was struggling to play because all of the action was sideways. There was an easy solution to that dilemma, however. 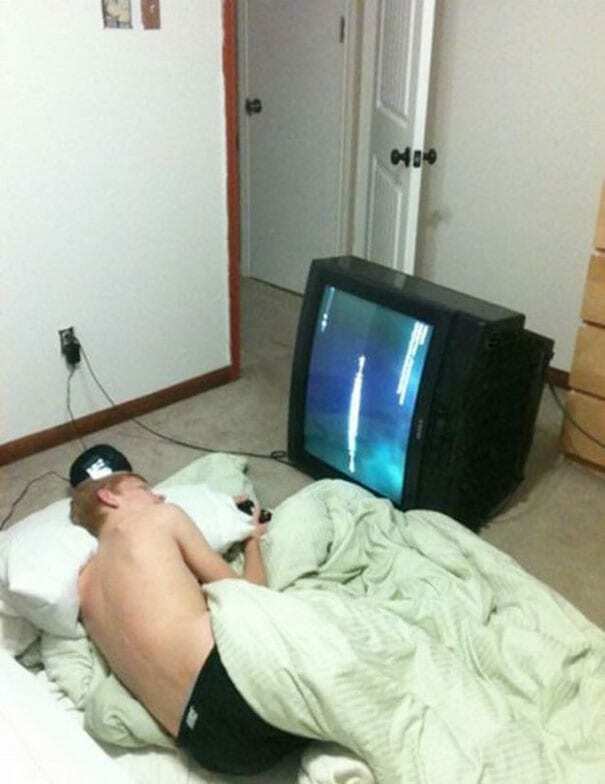 He went ahead and turned the television itself on its side, so that when he is lying down, the game is right side up. It looks pretty cozy and we wouldn’t be surprised if he stayed there all day. Filling your car with gasoline can be a nuisance, but it’s something that we all have to do. Usually, you pull up next to the gas station, get out of your car, and fill the gas tank. This man had a new, lazy idea. 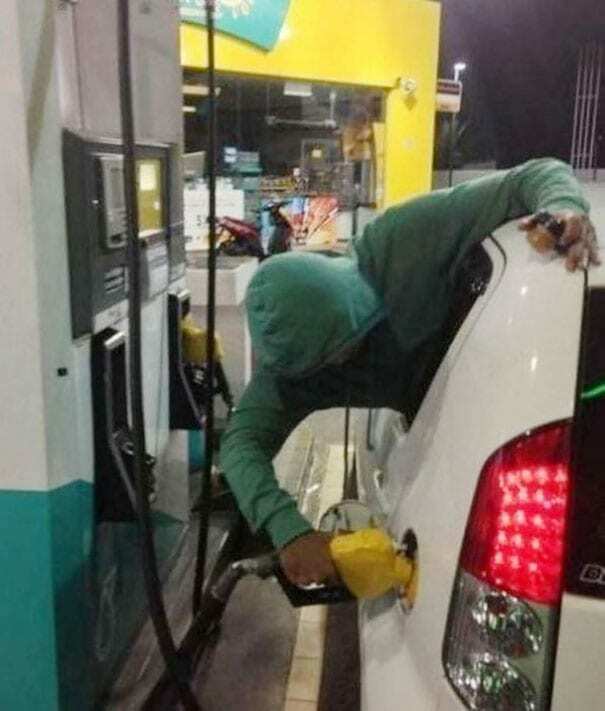 Instead of getting out of his car, he pulled up really close and reached out the back window to put the nozzle inside of the car’s gas tank. It looks like it’s working but we’re not sure if he’s really saving himself any energy. This lazy birthday cake is actually quite sad. 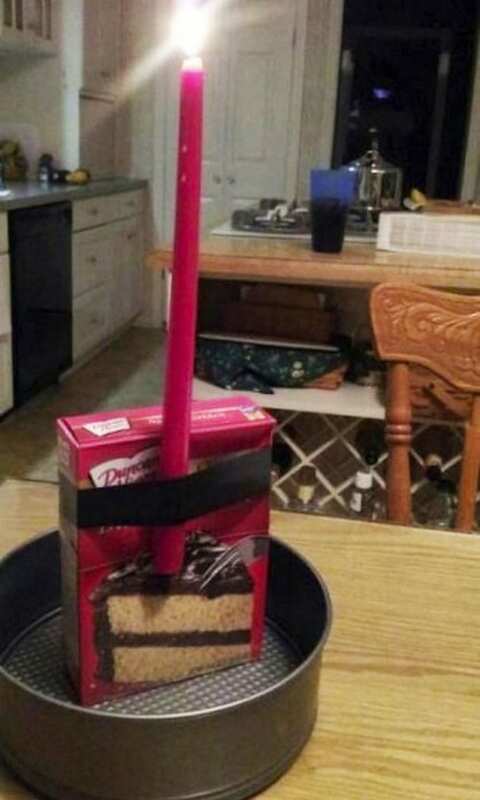 Whoever prepared this birthday surprise didn’t even take the time to bake the cake, instead serving a box of cake mix in a pan, with a candle taped to it. We would like to point out that the candle is not a birthday candle, either. We would be pretty disappointed if this is what we got for our birthday, so we just hope that the birthday girl or boy has a sense of humor. 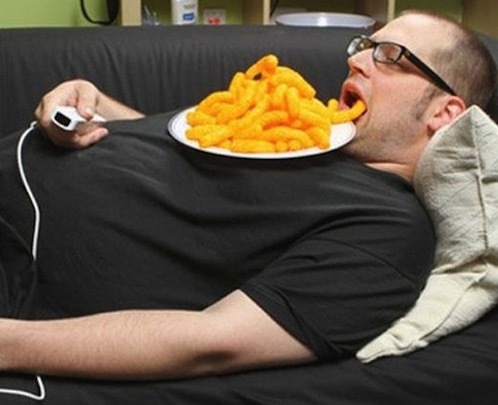 All this guy wants in life is to watch his television show, while not having to use his hands to eat. After all, how is he supposed to hold the remote if he’s too preoccupied with putting food in his mouth? No, this guy was on a mission, and he’s clearly accomplished what he set out to do. All he had to do was put his plate extremely close to his mouth, enabling his cheesy puffs to easily slide into his mouth – and it seems to have worked perfectly. The treadmill has never looked so simple, wouldn’t you agree? This woman wanted to get her reps at the gym, and this is something we can totally understand. It’s quite a common trend nowadays, and it’s integrated into our society pretty strongly. 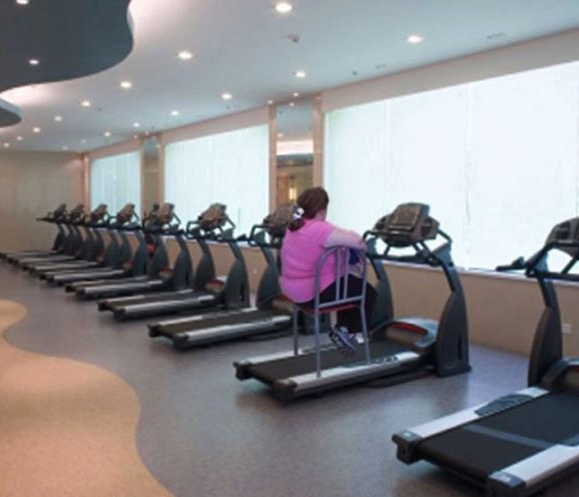 But instead of actually using the treadmill by running on it, she put a chair there. We’re not sure how she’ll get much exercise done like that, but hey… it sure gave us a chuckle, so maybe that was her intention. Firefighters are the heroes of our society, along with war veterans, police officers, and the like. But we had no idea that there were firefighters with a sense of humor. 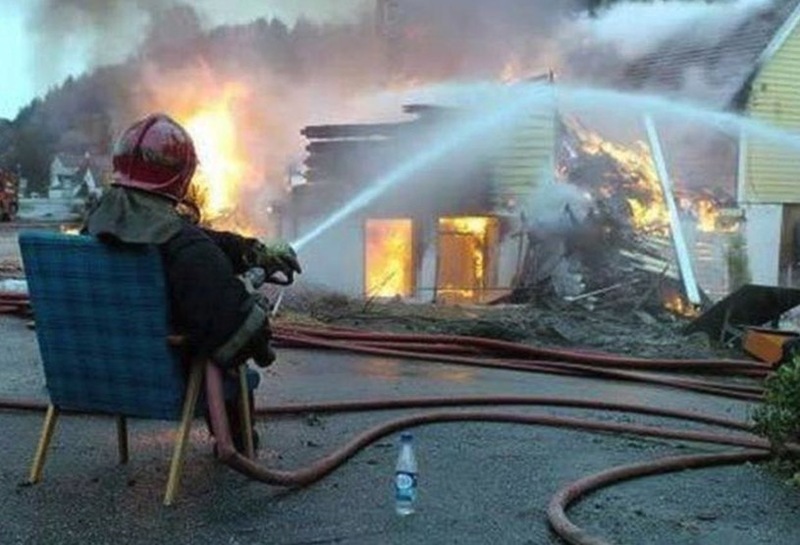 We have to imagine that it’s out of humor that he’s sitting on this chair – unless he truly is lazy. Another option is that he actually thinks it’ll help put out the fire faster, because it keeps him sturdier traction. Either way, the overall image is pretty funny to look at. Is this picture not the epitome of lazy? 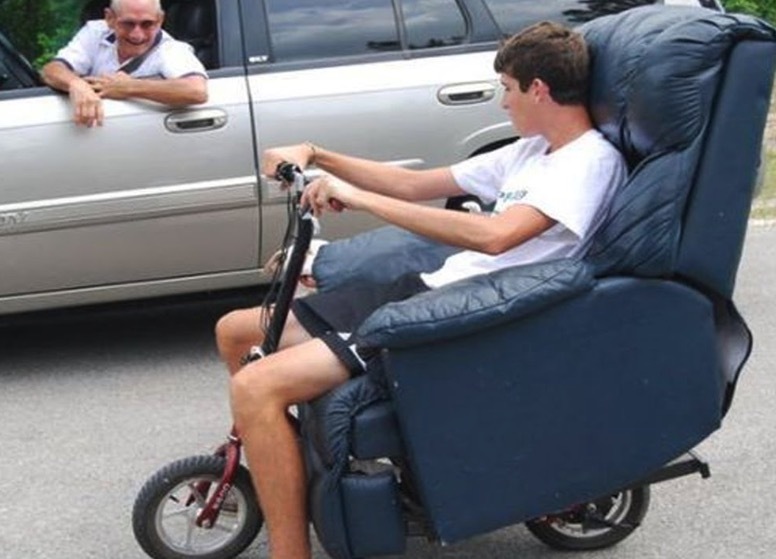 This young man was so adamant about not leaving his comfortable leather recliner that he actually attached it to his bicycle. The irony here is that it probably took a lot of work to do that, which is the opposite of laziness. And yet… sometimes lazy people are capable of extraordinary hard work, when they know it’ll excuse them from a lot more work later. It sounds strange, but it’s pretty amazing if you ask us. 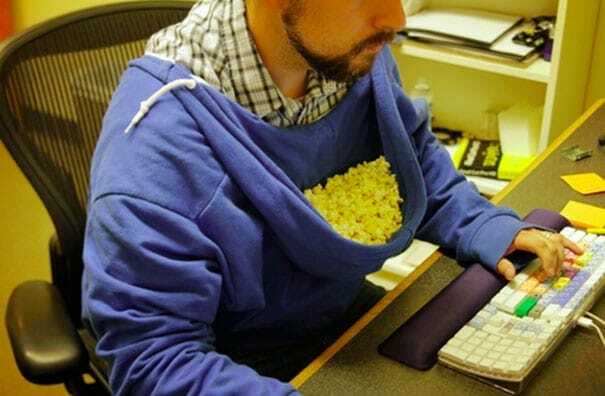 Not only is this genius, but we literally must have one. 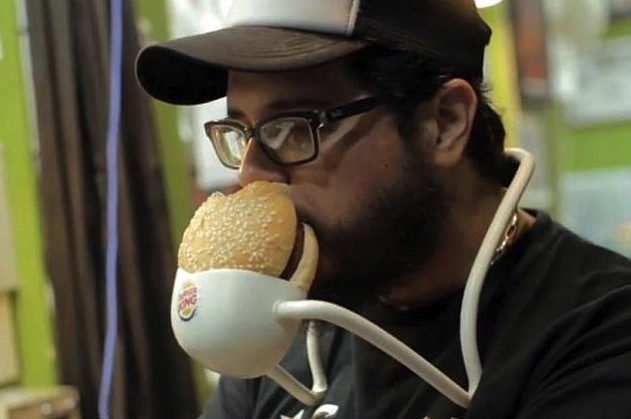 Is there not a more perfect solution for eating a hamburger if you’re a lazy person? It’s kind of like a harmonica holder, but instead of the musical harp, it’s a burger. Our only quip is the following question: What’s he going to do when he gets to the later end of the burger, and it’s a lot harder to reach? He might be in for a world of trouble then – but in the meantime, life is ship shape. There’s nothing worse than being in a line with tons of people, especially when there’s only one or two workers to meet your needs. The amazing this about this picture is that all of these people are lazy. They came together and realized that they don’t need to stand in line – they could simply put their shoes instead, and they would be the indicators of who’s next. Honestly, this is one of the most genius things we’ve ever seen – and we hope it gets implemented more in the future. When the holiday carols are being sung, and the lights are flashing around your block, you know that it’s time for you to get a Christmas tree. But while beautiful, they also take a good amount of time to set up. This activity isn’t for the lazy, and that’s why this person found the perfect solution. 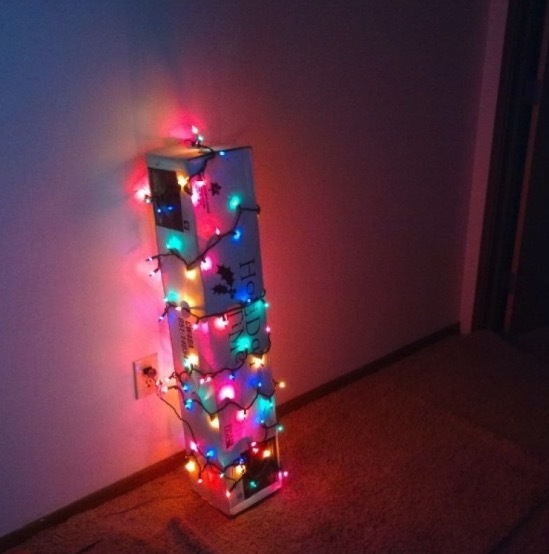 Well, sort of… Instead of taking out the tree (we’re assuming it’s a plastic tree), he just wrapped the lights around the box it’s in. Way to get in the Christmas spirit! This image might seem a little strange to look at, but take a little time to observe what you’re actually looking at. 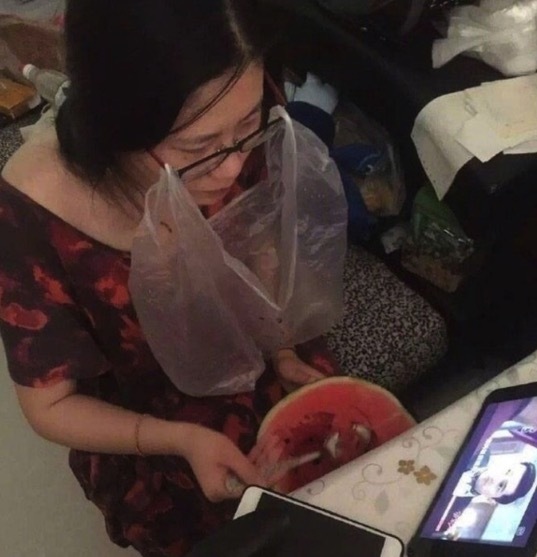 A woman has sat down to watch something on her iPad or whatever, while eating some watermelon beneath her. Her problem was, how does she eat it without dripping the watermelon juice all over her front? Her solution was inspired, to say the least. As you can see, she placed a plastic bag on her glasses – catching any drips of juice that may come her way. This poppa seems like a pretty awesome dude, given that he’s spending time with his little toddler, and “pushing” her on the swing. Then again, he seems to be pretty far away from her. 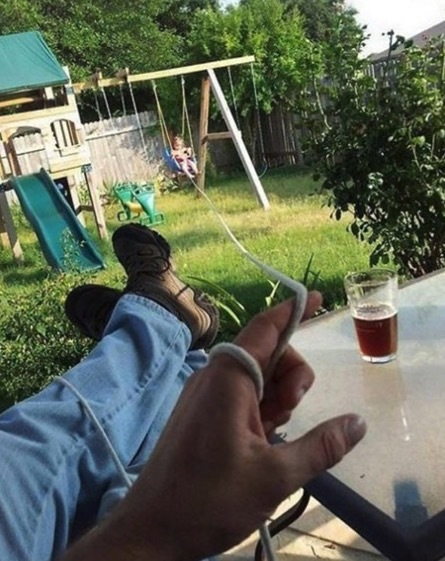 The man invented a pulley contraption that enabled him to push his daughter on her swing while he’s a solid 30 feet away at least. We’ll give him the benefit of the doubt and say that maybe he’s injured – but doesn’t he want to see her joyous expression while she swings? We all know what it’s like when we’re tired during the day and we just can’t keep our head up. It seems that this man came up with a solution, perhaps born out of a sheer unwillingness to keep his head up. This simple invention is a cloth that uses a cabinet above as leverage to hold his head up. He seems to be pretty pleased with himself, and it seems like he’s able to focus on his work now – so that’s always good.